I like the subtlety of the “man in the grey flannel suit” fabric. I imagine it very lovely from a distance and then, close up, “hey those are little men in grey flannel suits!” Prompting so many questions: Why? Just plain “why”? And why are they walking away, not towards? Are they all heading somewhere, together? Where? Can I come?And the yellowy-greeny fabric would be great for picnics–no worries about grass stains! I like the pastel yellow with the man in the grey flannel suit too. It would make a great half circle skirt to wear with a black shell of some sort and pretty black heels or flats for a vintage summer look. Marilyn D.
I love the koi fabric. Sure it is a bit obvious but it would be kinda cool as the trim of one of the kimono style dresses that are so popular right now. Less obvious but also fun would be lining on a coat although I don’t know how suitable that fabric would be for that. 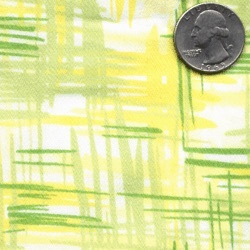 I think I had a dress made from that green and yellow print back in 1963, for Easter, iirc. Still pretty! Well now, that’s just eerie. Yesterday I was a-thrifting, and I bought cashmere/cashmere-silk blend sweaters in yellow, grass green, baby blue and red (I already have the orange. And the pink. And the purple, come to think of it. )No matter how much fabric I look at, it never dulls my senses. It confuses me, sometimes, but I never wind up not wanting it. I actually wind up wanting all of it; sometimes I want so much, I wind up getting nothing, because I can’t make up my mind!I can’t image giving up colour, though. Some of them might have a chance to rest, while I play with other combinations (or, who are we kidding, wearing black, because I get up at ohdarkthirty, and black is easiest, when you can’t open your eyes), but I never want to give them up. And I wear enough purple for both of us!I do like the pink. I would wear it in a crowd, mingling with the koi polloi …Bless you for your ambition posting today; a good flight, and a safe trip! Curses on you. I’ve somehow decided that what I need for this spring is a skirt with goldfish on it, but had just about convinced myself that the perfect fabric didn’t exist and therefore, I’m off the hook to actually make the thing. But now I know that the perfect fabric is out there and I actually have to make it. With luck, tons of people will see your post and go out and buy it out before I get a chance…But it’s perfect. Has that Asian feel, but it isn’t too busy with things like ladies in kimonos and cherry blossoms and such like every other piece of fabric I’ve seen that has goldfish on it. I’m with Kim, I don’t know how you can resist at least two of them. 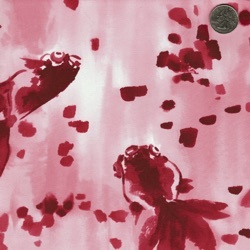 Though I like the idea of the koi, and I like both red and pink (even together), the colors somehow don’t match the pattern for me, so even I can resist that one. 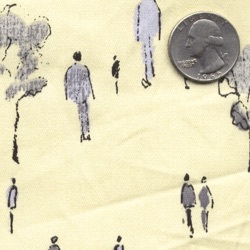 I agree with kim p., the “man in the grey flannel suit” fabric is just lovely, and intriguing, and subtle. I’m really liking the koi fabric. It’s so unique! And this is Erin, promoter of fun prints! Maybe a circle skirt, since you might as well be flamboyant and obvious about it…the grey flannel suit one is cute, too. The fish fabric made me squeal! I love it. What style of dress do you see making with it? I am intrigued by your plan to limit your color selections. I am in a conservative field and would like to limit my color selections as recommended in the wardrobe plan from the Australian magazine you published a few days ago. Any ideas on “conservative” color choices for maximum switchability? I see the koi print in a 1950s shirtwaist with a full skirt, pockets, and a satin ribbon belt. Oh, yeah, and cute red flats!! Hi, I heard you speak on a panel last night and think you deserve a tv show of your very own. On another note, the gray flannel suit pattern reminds me of some art work I saw by an artist named Sarah Gates. I don’t know much about the time line in the production of fashion fabrics, but I would be surprised if the creator hadn’t seen Gates’ work or vice versa (although I guess it ain’t necessarily so). I am pretty sure Gates owes her final product to PhotoShop. I doubt that’s so of the fabric designer. But (perhaps I should insert ironically here for old time’s sake) I do think word play is a fine excuse for creating a dress. Anonymous with Colour Question: It depends, in part, on what your field requires. If you are in banking/finance or the law, the two most suitable colours are still navy and gray. Fortunately, the two colours work really well together. If you can find it, a very useful book is Working Wardrobe, by Janet Wallach. Since her book, which introduced the Wardrobe Capsule Concept, was published in 1982, I think there are a lot of authors who owe her some acknowledgment, since I believe their books came out long after hers! One of them (which I need to get myself) is Nancy Nix Rice’s Looking Good, which deals with the capsule concept and wardrobe planning from a sewer’s point of view.Back to you. Start with Navy and Gray, or, if you prefer, black and gray; it’s best to choose one or the other, so that you don’t have a closet full of black and navy accessories. (Of course, you could say To Heck With It, and just wear black accessories with navy; I do.) The key is choosing shapes and fabrics which work with each other, so that with a gray suit and a navy suit, you can swap out the jackets (gray jacket with the navy skirt, navy jacket with the gray skirt) for more casual occasions, and you can introduce a navy/gray plaid suit, a navy/gray tweed suit, a navy or gray pinstripe suit, etc., into your wardrobe, and all the pieces will work together. I regret to say that despite what a lot of fashionistas have to say, it really is still navy and gray – and black – for suits, in those two particular fields, especially when you’re first starting out. You can introduce brights in terms of scarves, blouses, etc., but the basics should be … basic. You can concentrate on unusual cuts, and quality accessories, but you really want to stay away from most other colours for suits. If and when you feel you can branch out, you might want to introduce burgundy into your wardrobe – burgundy will work with navy or gray. But start with navy and gray; it will be easier on your wallet, if you limit it to two colours to start with. Its not as limiting as all that; you have the option of skirt suits, trouser suits (if your field allows), and dresses. As far as blouses go, start with white again, very basic; the next colour I would suggest might be a light blue. If I may ask, what is your field? I love the goldfish! But sateen suitable for pants? I’d really prefer a light, flowy skirt, so I guess that’s my justification for not buying it. Oh, but a circle skirt could work I guess…I’m surprised they haven’t sold out yet, based on everyone’s excitement over it. Thanks, Belladona. I am a trial attorney. I had come to some of the same conclusions as you did. My basic colors will be black and gray. My accent colors will be red and white. I’m searching for my gray and black pattern now. Thanks for your thoughts. I too love the koi print. I found something very different (but with koi!) on ebay that I’ve made into a handbag. Wish I could get this one, too!And I love the man in the gray flannel suit. There’s something very stark but illustrative about the print.